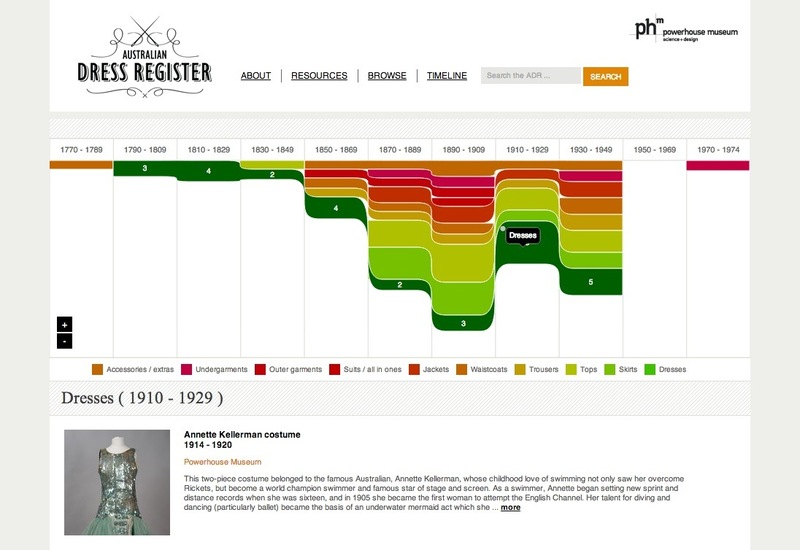 The website offers two entrance points to the dataset: via a browsing interface or via a timeline. As timelines are of particular interest for my research, let’s look at this one first. Time is separated in decades and stretches from left to right, with the years 1860–1974 in view. The most recent “decade” is actually only four years long, probable because the newest item is from 1974. A notification box encourages the user to “click + drag” the timeline to navigate. Two zoom buttons are also present and allow changing the scale of the separations to encompass one year to a century. Coloured bands meander through the times in a pattern reminiscent of 1980ies logo design. The colours represent different garment categories such as suits, jackets, trousers or dresses. They range from orange via red to green and the visual proximity of the colours makes it very difficult to differentiate between them. Also, the arbitrary vertical stacking of the categories, which causes different categories not to align horizontally makes it hard to compare the amount of items in a particular category across time. The designers actually seem to be aware of these flaws. When hovering over a band, the category name and numbers of items per time section are displayed — a workaround and a pity that the visual representation fails. It might have been a better choice to opt for a tabular view and put each category on its own row. Zooming in and out also doesn’t really help to make better sense of the data. There is no smooth transition between different zooming steps and clusters form or disperse seemingly at random. A visual indication of the zoom level is also not present and one fails to have a feeling for how “close” one looks at the data without relying on the labeling. The browsing interface on the other hand provides a rich and engaging interface for exploring the collection. On the left hand side, a panel with filtering options in different categories allows to the user to browse the dataset without specifically looking for something. One can choose to view only trousers that are in good condition, or dresses that have been worn by men (the dataset contains two matching items, a boys dress and a diver’s suit). Within one category of filtering criteria, there are no subcategories. Sometimes this might have been appropriate, such as in “place of origin” or “damage”. On the other hand, the relatively small size of the dataset allows such a flat hierarchy and for many users this might be easier to handle. A bar at the top offers view options (list or thumbnails) as well as a few sorting options(relevance, alphabetical and most recent). It is not evident what date is considered in the “most recent” ordering. Possibly, it is the date of acquisition as the displayed dates of the garment are not in the correct ordering. Sorting by “relevance” also does not seem to make any sense when browsing, it can however be helpful when searching for a specific item via the search form. Where the Australian Dress Register really stands out is in the display of single items. It should not be too much asked to display database records in a thoughtfully formatted way, but this is where most online collections fail. Usually, the full record is just dumped on the screen with every database field formated the same way. The individual records of the Australian Dress Registers are very well formatted, playing with different font sizes depending on the importance of the information, checkboxes to indicate certain properties and tabular information of the garments measurement — even with the option to convert the metric specifications to inches. Two thumbs up!